A ski development of some sort was proposed for Cobble Hill in Tyringham in the 1930s. While the proposal included a ski trail, it is not known if a lift was planned. The proposal led to the protection of Tyringham Cobble. 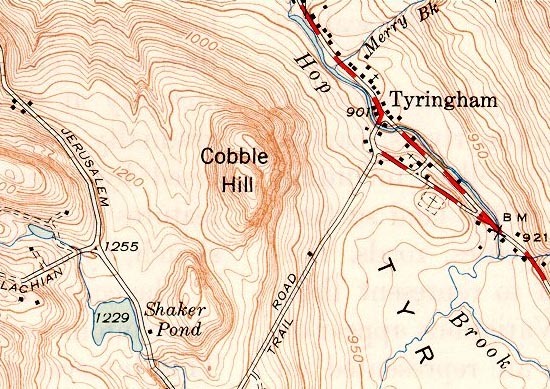 There are no known remains of Tyringham Cobble ski area.
" In the 1930s, Olivia Cutting James and a group of conservation-minded friends purchased seven parcels comprising Tyringham Cobble and its surrounding pastures to protect it from development (A ski run had been proposed). Calling themselves "The Cobblers," they set up an informal association as tenants in common. In her 1961 will, Mrs. James left The Trustees an endowment to maintain the Cobble, and expressed the "earnest hope" that the surviving tenants would give the property to The Trustees as a gift, which they did in 1963. "